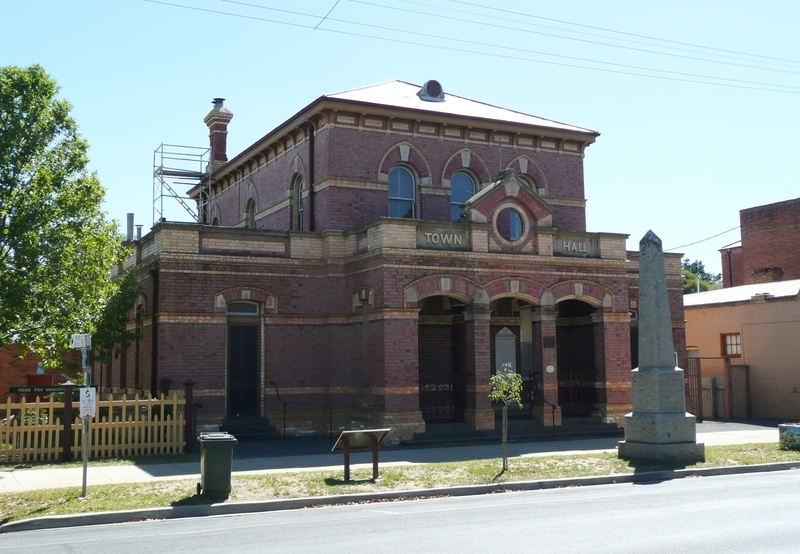 The Dunolly Town Hall was originally built as a courthouse by the Public Works Department in 1884. 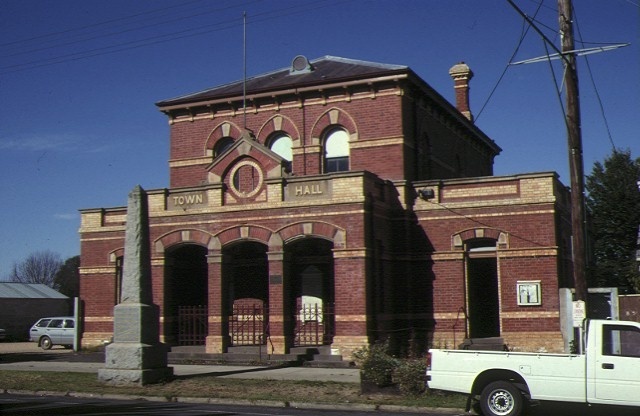 The first town hall was built in 1862-63 but proved to be too small for large gatherings. 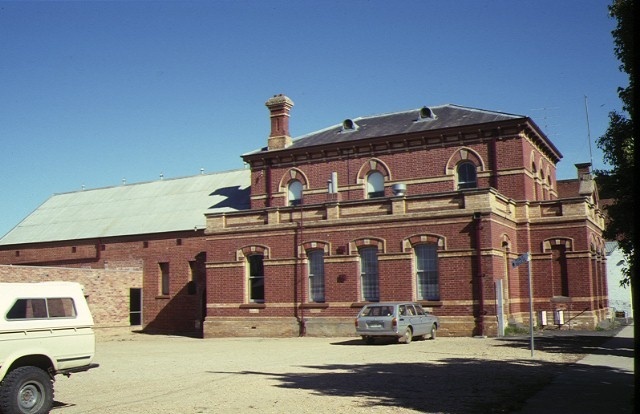 In 1887 plans were made for the extension of the town hall but, prior to the finalisation of those plans, local suggestions came forward that the court house was extended by the construction of a hall at the rear. The original courthouse was designed by John R Brown of the Public Works Department and is constructed of di-chrome brick in a pavilion form with the elevated central section having a bracketed hip slate roof and a projecting arcaded porch at the front. The detailing of the exterior is exotic in its use of contrasting brickwork and rendered dressings and in using a variety of pointed and segmental arches. 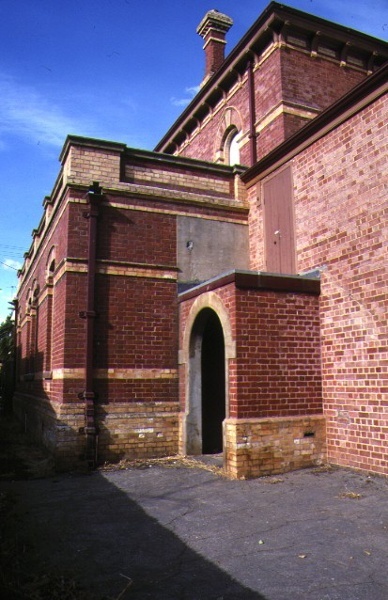 In form and decoration it is similar to the courthouses at Camperdown (1886) and Warragul (1886). Internally the central hall has its ceiling divided into three sections by spanning beams. Three of the flanking rooms have surprisingly retained their original decoration including a stone wallpaper which is relatively late in its use. The hall added to the rear is at a lower level and has a coved boarded ceiling and a balcony at the rear with a cast-iron balustrade and a stage to the front with a simple proscenium arch. 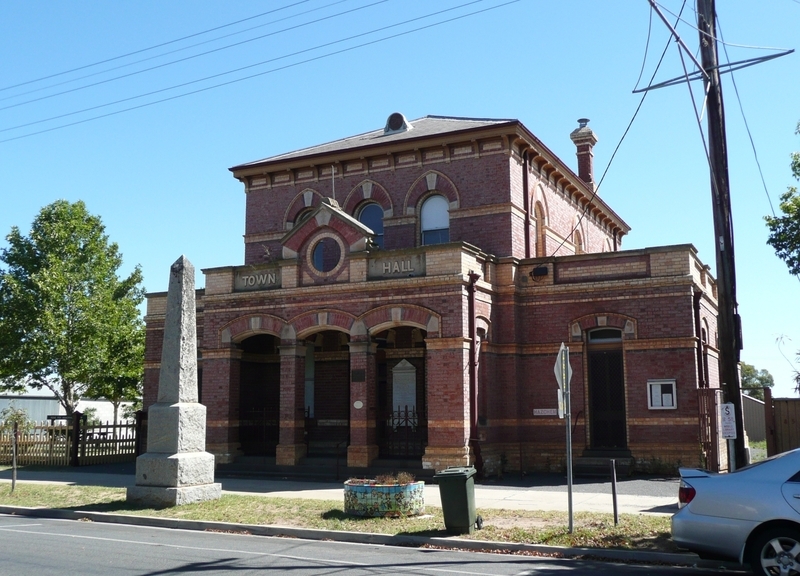 The building is of significance as a fine example of high Victorian public architecture surviving largely intact including some internal decoration and as an important element in the streetscape of Dunolly. Historic Building No. 593 Dunolly Town Hall, 83 Broadway, Dunolly (to the extent of the whole of the building and the land entered in the Register Book as Volume 1525 Folio 807).